Her tribes are from the Sonora state of Mexico and Tucson, Arizona. The Apache and Pascua tribe are mostly in Tucson. Yaqui tribe have migrated from Sonora, Mexico to Tucson, Arizona to California and other states. Michelle does some storytelling that talks about a little girl who listens and speaks of a tree which foretells the future of the Yaqui people. She mentions about the changes of the their people due to the European Spaniards and the Trains. Michelle mentions the true name of the Yaqui ( Yaqui meaning- Do you speak?) and the Spaniards interpretation of Yaqui as their tribal name. Yaqui really is Yo’owem. Michelle continues speaking of the Yaqui and Pascua tribal ceremonials. 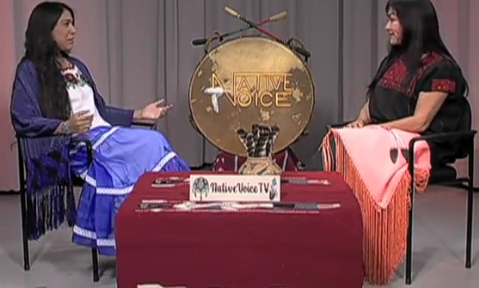 Cihuapilli Rose Amador interviews Jesse Hernandez (Yaqui/Chicano) of the Bay Area on Native Voice TV. Hernandez continues to show his art work and explains how his ‘Urban Vinly Designer Toys‘ originated from China and Japan. He shows his first production toy (limited edition of 100 in the world) ‘Aztec Rain God‘. Hernandez continues with how he keeps pushing the envelope of keeping his original hand drawing into the ‘Digital’ software world. He uses Flash a two dimensional web animation program and creates his first animation, ‘Writers Block’ which was on Adams Film. The show goes on to talk about his first big gig of the Filipino culture of Adult Cartoons called, ‘The Nutshack‘. This is a must SEE! 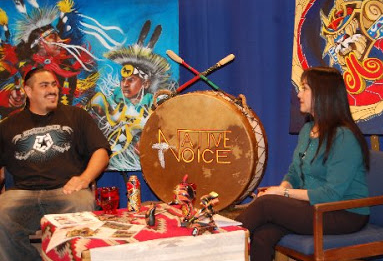 Cihuapilli Rose Amador interviews Jesse Hernandez (Yaqui/Chicano) of the Bay Area on Native Voice TV. 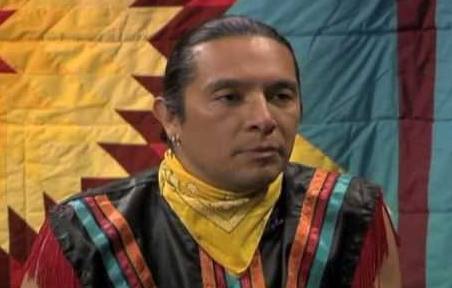 Hernandez speaks about how he started his art career once he left high school and went to the ‘Art Institute of South Dakota’ and studied from a painter named ‘Robert Penn (Died Feb. 12, 1999) and Penn was influenced by the Oscar Howe (First – Contemporary Native American artist). Hernandez continued his education and received his BSA in ‘Digital Media and Animation’ from San Francisco Art Institute. Hernandez had shown his art in New York, Chicago, Los Angeles and other cities across the country. Throughout the show he continues to show his various art forms. Gamboa gives the history of how the American Indian Education Center became into existence and now a non-profit 501.c3. She calls herself more than a program coordinator for she is person of ‘Jack of all Trades’. The emphasis for the students is to incorporate Native Culture tradition and arts within their studies and engaging them in community involvement. 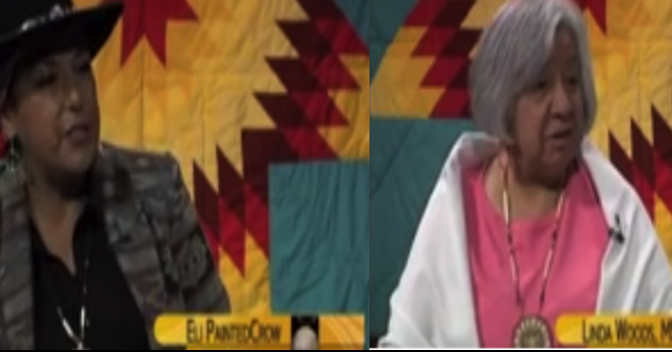 Cihuapilli Rose Amador LeBeau interviews two women veterans – Eli Painted Crow (Yaqui) & Linda Woods (Ottawa/Chippewa) on Native Voice TV. 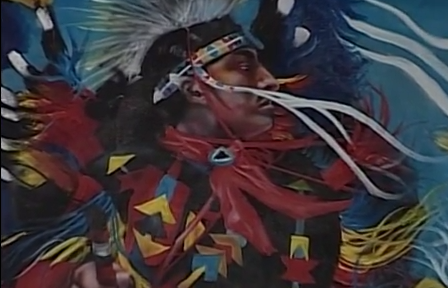 Eli Painted Crow is a Yaqui, U.S.Army Veteran who served her last tour in Iraq. She has spent the five years going across the nation to speak about Native veterans at universities. She speaks about the Post Traumatic Stress Disorders and the hardship faced for Native women. Linda Woods is Grand Traverse Band Ottawa & Chippewa, U.S. Air Force retired. Linda is an elder returning back to her home in Michigan. She spoke the times of the Civil Rights and Anti-Vietnam protests, the southern racism. Linda received her Master degree in Social Services (in 1994) at San Jose State University. She works with Native people in recovery from Alcohol and Addictions. 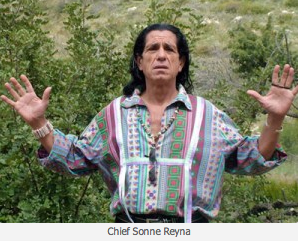 Channel 54 @ 8:00 P.M.
Cihuapilli Rose Amador and Sundust Martinez interviews Chief Sunne Reyna on Native Voice TV. Reyna begins speaking of world wide prophecies in which there is a resemblance of ending and beginning. He speaks of the beginning of ‘Human World Evolution‘ due to many world prophecies which have been told. The human value of ‘Greed’ and ‘Selfishness’ will end and the Human World Evolution of ‘Respect’ and ‘Sharing’ will be mostly valued. Tuesday, May 6th on KMVT Comcast Channel 15 @ 8:00P.M. Cihuapilli Rose Amador and Sundust Martinez interviews Revision Production Company – Eddie Madril (Yaqui), Sara Moncada (Yaqui) and Doug Heinz on Native Voice TV. These actors performed a short play (Skit) called “A day in the Life“. After this short play, each of the actors talked about their production company, where they have mostly performed (Bay Area Universities), and who the intended audiences were (Non-Native). Madril emphasizes that we are all “HUMAN BEINGS” and the plays are written about Native people in a non-aggressive, non-abrasive, non-militant way. KMVT Comcast Channel 15 @ 8:00P.M.